The NABJ Career Center is the official job and career website for the National Association of Black Journalists. Founded by 44 men and women on December 12, 1975, in Washington, D.C., NABJ is the largest organization of journalists of color in the nation. Many of NABJ's members also belong to one of the professional and student chapters that serve black journalists nationwide. Providing informational and training services to the general public. 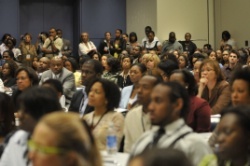 NABJ holds an annual convention and career fair each summer with dozens of plenary sessions and workshops for professional development. The career fair draws hundreds of recruiters and is among the best means of finding a job in the industry. The annual Salute to Excellence awards and special recognition honors (Lifetime Achievement, Journalist of the Year, Community Service, etc.) are bestowed at each convention. Each year, NABJ awards nearly $100,000 in scholarships and internships to college and high school students nationwide, as well as fellowships for seasoned professionals. The NABJ Media Institute provides professional development and technical training for black journalists at venues across the country. NABJ is headquartered on the campus of the University of Maryland-College Park, 1100 Knight Hall, Suite 3100, College Park, Maryland 20742. Every two years, the membership elects a president and national board of directors to govern NABJ. An executive director leads the national office staff.